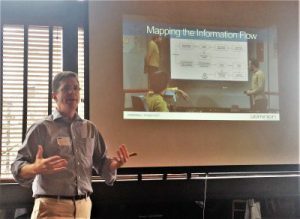 Last week I had the pleasure of jumping up to Boston to present at ARMA’s Boston Chapter. The topic was a familiar one, Information Governance in the Age of Digital Transformation. I updated and expanded my keynote from the 2016 Information Governance Conference to allow the attendees to receive the latest insights. As expected, it was a great event with a lot of good conversations about how we can take a fresh approach to Information Governance. This is a real need as many organizations are still struggling to make strides more than two decades after beginning this journey. This is a scary concept for many. The problem is that people forget that proper Information Governance has five basic steps. Capture: Know where information resides. Protect: Prevent information from being changed, lost, or otherwise compromised. Control: Enforce all laws, regulations, and policies that need to be followed. Dispose: Complete the information lifecycle as a historical asset or a purged, outdated asset. Too often, people focus on the final two components, Control and Disposition. This is only two of the driving factors in Records Management. In Digital Transformation, the focus is on the business needs of the organization. We work to capture, classify, and map information in order to improve the business’s ability to deliver on its mission. Remember, if we do not capture information, we can never manage it. Working on Digital Transformation efforts is a quick way to jump start an Information Governance effort. You learn where information lives and how people use it. Adding the needed controls later is a more organic step, one that is not as scary as leading with Records Management. Not every organization has active Digital Transformation efforts. That does not mean that information professionals should sit around and wait. You can take simple steps to start now. The first is to assess where you are in governing your information. You can conduct an assessment internally but experience has shown that bringing in a third party helps cut through the politics. TeraThink can help, whether you are starting at the department or organizational level. We talk to teams and map their core processes. These are those processes that focus around their mission. We determine where the information resides and how they share information with other groups. Once we map the information, we identify and prioritize next steps. We do not always recommend replacing the most basic technology. We prioritize where the most value can be gained, balancing value with the cost and timeframe to implement. When the organization needs to shared information between teams, and sharing is absent or manually intensive, it is important to digitize that process. Want to See the Presentation? If you still have questions, or would like to chat about how your organization can start down this path, feel free to reach out to me on Twitter or contact me here at TeraThink. We can focus you on achieving a better Information Governance future.